The 2-Part Grasshopper workshop at UCLA covered a wide range of topics surrounding the use of Grasshopper and parametric approaches to design. The first part of the workshop introduced the students to the interface and data structures. 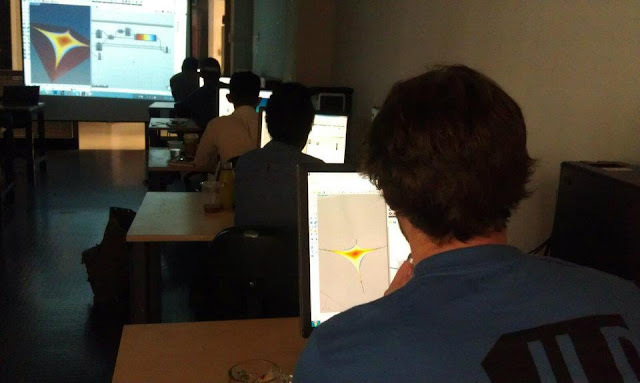 The students were walked through simple geometry exercises for creating parametric systems. 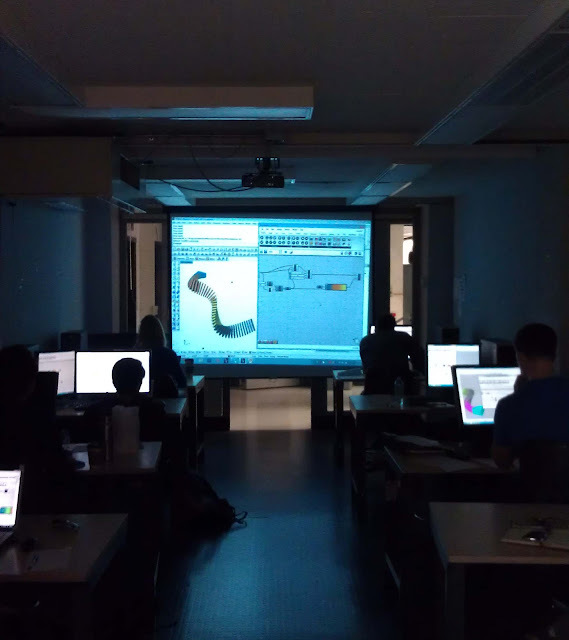 The second part of the workshop exposed students to a few popular Grasshopper plug-ins including Kangaroo and DIVA. My new TPG plug-in was used throughout to quickly define paneling and structure logics. This Saturday I will be instructing part 2 of the Grasshopper workshop @ UCLA. This session will focus on more advanced topics and will make use of two popular plug-ins: Kangaroo and DIVA. 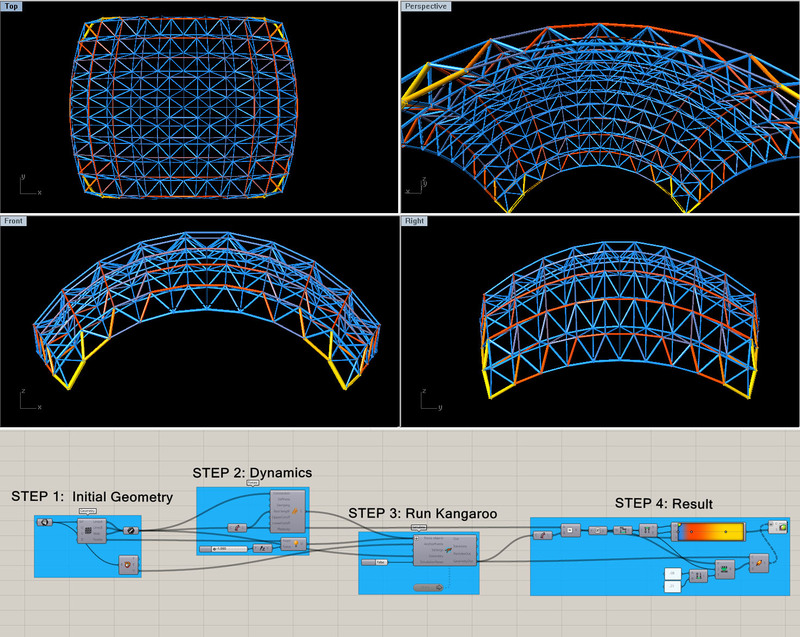 In the first half of the workshop, the class will look at Kangaroo Physics to study various forces on parametric structural models and surfaces that can be created with some of The Proving Ground tools. The second half of the workshop will look at daylight analysis using DIVA. A solar-responsive facade system will be created which responds to daylight parameters. The interest level has been very high for this collection of Grasshopper components. 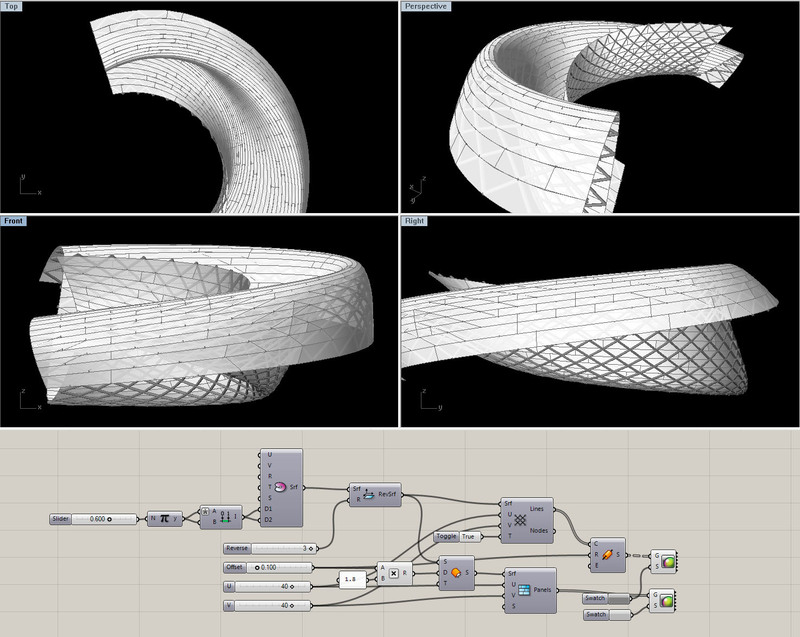 I have made an update to the plug-in to include some additional geometry utilities and more structure components. I have quietly spent some time giving the wikia big overhaul. I haven't advertised it on my main blog since I wanted to make sure there was enough content there to be of interest. As a key component of this, I have added a lot of content to my program lab. The page includes a growing collection of scripts. My focus right now is on documenting code for RhinoCommon and Grasshopper that I think may be useful in scripting workshops. 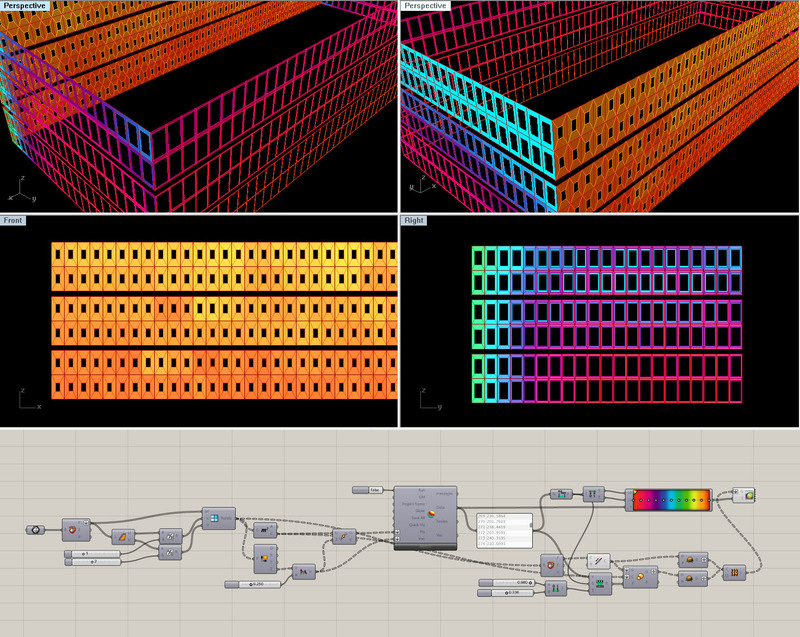 Processing and Revit code is also sprinkled throughout. If you have been following my Facebook page, you may have noticed some image galleries pop up showing off the content there. I am also releasing the first version of The Proving Ground plug-in for Grasshopper. This plug-in is a growing collection of some of the more useful code from the wiki. The focus is on parametric shapes, paneling, structures, and workflows... check it out and do not hesitate to make recommendations or report bugs. ...I thought it would be good to reward my readers with an update on something many have been excited to know more about. I am in the process of prototyping some functionality and work flows for a new tool.... Slingshot! for Revit. Generally, the tool will provide different means of connecting Revit (and Vasari) to relational database management systems, including MySQL. More importantly, I am interested in establishing common database schema that will allow for a more fluid workflow between Revit and external design tools like Rhino and Grasshopper. 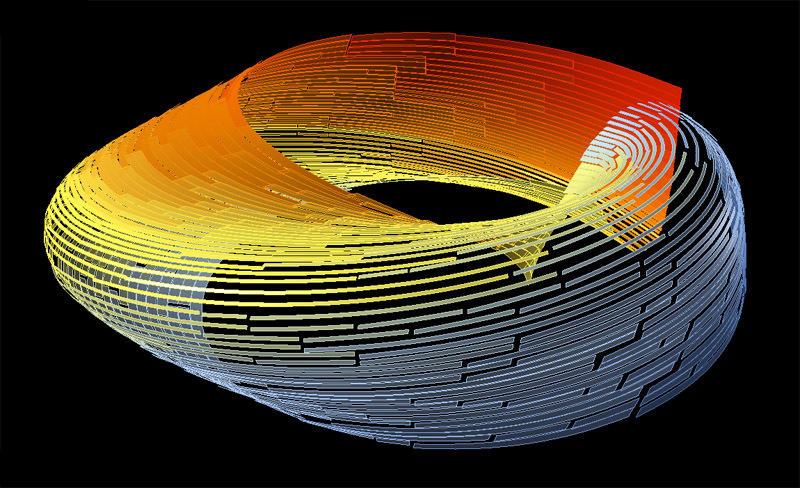 This includes sharing parameters and geometry. I had developed several proofs-of-concept in late 2010 and previewed a few demos at ACADIA in New York... but finally I am finding time (and motivation) to give this the push it needs. Well that blackout was fun! 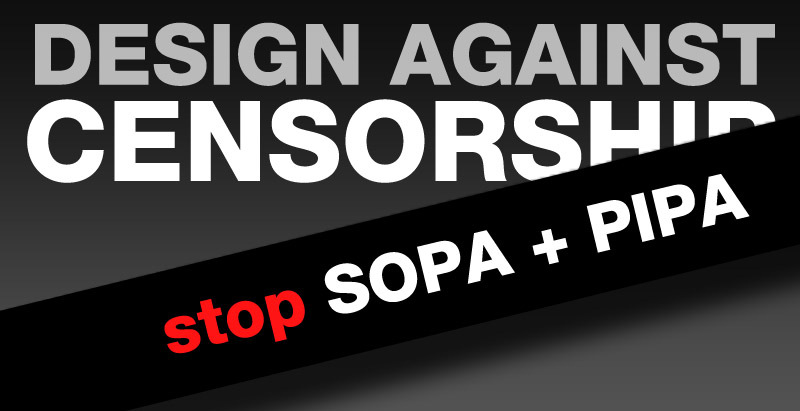 The Proving Ground will be joining the blackout in opposition to SOPA and Protect IP tomorrow, January 18th starting at 12AM PST.... A free and open internet is essential for innovative, community-driven technology, tools, and design! For 4 years, I have used this blog as a medium for sharing some of the things I have been up to with regards to design, computation, Grasshopper, BIM, and so on. Blogging and the open sharing of ideas is a huge passion of mine and will continue to be so. I firmly believe that an open and uncensored internet continues to bring about new avenues for innovation and contributes to the betterment of society. Without the basic idea of an open internet, I believe that the design tools we love to use and the communities that support and expand them would not have been able to come into being to the success that they are experiencing today (if at all).... No Grasshopper, No Blender, No Processing... No Kangaroo, No Geco, No Diva, No Slingshot, No GeometryGym... and the list goes on. This may sound like an extreme assertion, but having spent much time in a country (China) that actively censors the internet and prevents their citizens from accessing social media sites like Facebook (and, yes, even blogger sites like this one) I can say that this is no joking matter. This week, you may notice that some popular internet websites, such as Wikipedia and Reddit, are participating in a 'blackout' of services in protest of bills in the United States congress: the Stop Online Piracy Act (SOPA) and the Protect Intellectual Property Act (PIPA). While the intentions are to prevent internet piracy, the bills would also dangerously affect the DNA of the internet by making internet censorship a matter of law in the US...and possibly influence other countries to pass similar measures. The Proving Ground opposes internet censorship in all its forms and supports innovation through the freedom and sharing of ideas. And even if these bills are defeated, this probably won't be the last time we see something like this... so keep your eyes open. Starting this weekend, I will be teaching a 2-part Grasshopper workshop @ UCLA. The workshop is open to UCLA students interested in learning basic and advanced parametric design techniques with the Grasshopper plug-in for Rhino. Originally published in 2009 as part of the ACADIA conference. This article is an overview of the parametric tools and systems used in the design process of civic and sports architecture at NBBJ.